Flutist and Yamaha Performing Artist, Sophia Tegart, performs regularly throughout North America, Europe, and Asia as a member of the Transformations Duo, the Cherry Street Duo, and Pan-Pacific Ensemble. She has performed with the Oregon Mozart Players, Des Moines Metro Opera, Kansas City Chamber Orchestra, and Kansas City Symphony. Currently, Tegart is piccolo in the Colorado Mahlerfest and second flute in the Washington-Idaho Symphony. She serves on the faculty of Washington State University as Clinical Assistant Professor of Flute and Music History. Tegart received her DMA in Flute Performance from the UMKC Conservatory. 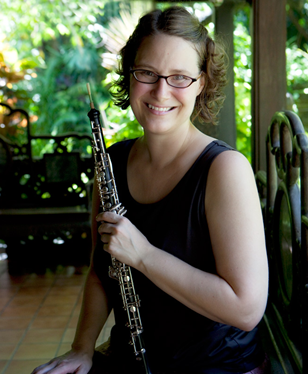 Keri E. McCarthy, oboe, has been active performing across Southeast Asia for over twelve years, and has commissioned over a dozen pieces from various composers based in Southeast Asia and China. In 2013 McCarthy helped to found the Light through Music project, bringing double reed instruments and instruction to music centers in Myanmar. In 2011, she completed a Fulbright award in Bangkok, Thailand, researching connections between Thai traditional and contemporary music, commissioning Thai and Malaysian composers, and performing new works with professional oboists in the Philippines, Thailand, and Singapore. She also completed a 2008 solo tour of Southeast Asia, commissioning and premiering works by composers from the region. She has premiered works at International Double Reed Society Conferences in 2006, 2007, 2014, and 2015 and was featured playing the Mozart Oboe Concerto with the Washington Idaho Symphony in December 2011. Shannon Scott commissions, performs and records new works by American composers including Lowell Liebermann, Libby Larson, Derek Bermel, Daniel Dorff, Pierre Jalbert and John David Earnest. In the summers Scott teaches and performs as principal clarinetist of the Eastern Music Festival in North Carolina and at the Red Lodge Music Festival in Red Lodge, Montana. She is principal clarinet of the Walla Walla Symphony (WA) and has performed with the Spokane and Washington-Idaho Symphonies. She spent three years in France, earning diplomas and performing as a member of the Lyon Opera Orchestra in Lyon, France. Scott holds degrees from Juilliard, Ecole Normale de Musique de Paris, Conservatoire Regional Marcel Dupre, Yale University and Northwestern University. Michael Garza is a professional American bassoonist living in Guangzhou, China and working as the principal bassoonist with the Guangzhou Symphony Orchestra. Garza is active in music education throughout the Guangzhou metropolitan area, a promoter of classical and contemporary chamber music in southern China, commissioner of new works for bassoon, and an active volunteer in music-education based projects in Yangon, Burma at the Gitameit Music Centre and other Yangon-based institutions. Martin King has performed and taught horn across the United States. He has extensive experience performing orchestral and chamber music, and has taught musicians of all ages in a variety of settings. King has also been involved in commissioning projects with American composers Douglas McConnell and Amir Zaheri for a variety of ensembles.